The battery in the Nissan LEAF has always been the cause of some concern, ever since some examples from the first few years of production seemed to suffer from premature degradation, leading to replacement. Since then, things have improved dramatically, though concerns and issues remain. In light of all this, you may be wondering how the 40-kWh battery in the overhauled 2018 is faring in this regard. While we may not be able to offer up a comprehensive answer, the video above does offer some interesting data generated by one vehicle. Found in the Lemon-Tea Leaf YouTube channel, the footage gives us data captured by a LEAF Spy device (here’s how to install that, in case you’re interested) and plotted out over several different charts. The car’s owner, James, has now owned the vehicle for eight months and in that time, driven 12,442 miles (20,023 km). According to his calculations, the battery state of health — its energy capacity level — has fallen to 97.42 percent of its original ability. Other interesting data includes the fact that it has had 165 DC fast-charge sessions and 163 level 1 or level 2 AC charges in its short history. Using this information, James does a few future projections and sees some interesting results. While we won’t spoil the video for you here, we will say that at least some of the numbers are encouraging. Of course, each and every LEAF will yield different results, depending on a host of factors, including the amount of fast charging that is done, the number of deep discharges and 100-percent full charges, not to mention the environmental conditions it is driven and charged in. So, as we cautioned at the top of this piece, if you are also a LEAF owner your result will vary from those of James. All in all, though, the numbers are encouraging. 32 Comments on "2018 Nissan LEAF Battery Health Tested After 12,000 Miles"
The LeafSpy Pro App is reporting a SOH (state of health) of 97.42 after 8 months and just under 12.5k miles. Average 40kWh Leaf annual battery degradation (SOH) should be In the 3% +/- range. In roughly 4 months, the 40 kWh Leaf will probably dip a little below 97% SOH, as miles driven should be well over 15k mi., considering the current heavy usage driving pattern. Back to back DC fastcharging on road trips, with heavy down hill battery regen sessions, can inflate the LeafSpy Pro SOC numbers by as much as 2.0%. By taking readings after having no significantly hard or excessive regen sessions, and only level 1-2 charging, can one get accurate every day consistent and more accurate LSP SOH measurements. Back-to-back DC quick charging no longer has any effect on the 2018 Leaf battery stats in LeafSpy. Neither I or anyone else I know with a 2018 Leaf has ever seen the SOH go up by even .01%, but on the other hand the drops are also small (but steady). They seem to have significantly overhauled the BMS software. The 24 kWh and 30 kWh Leafs that undergo heavy regen cycles during deceleration, or down longer stretches of down hill roadways, can temporarily (for between 1-10+ days) inflate the LeafSpy Pro SOH % numbers, by at least 1.0 -2.0+ %. Good to know that this reporting error of margin, is no longer present in the BMS software, on the 40kWh 2018 Leaf. I don’t think that the assumption that the battery will degrade linearly with miles is a valid one. From my understanding, it’ll tend to be an geometric decay with the highest decay when it’s new. After 240,000 miles, he could expect the capacity to be .975^10 = 78% and after 480,000 miles, it’ll drop another 22% (of 78) to 60%. I think you’re right. But different cells have different behavior so only time will tell. The exact decay curve is different for every cell type; but in general, the first few percent are quickly lost during the first couple dozen cycles (as the SEI layer forms on the anode), after which a long phase of slow, pretty linear degradation is entered. For some batteries, degradation accelerates again and capacity quickly approaches zero once a certain point is passed; while others keep dropping more or less linearly to the end. It’s not geometric for any Li-Ion cell type I have ever seen a degradation curve for. But as the battery is degraded, range is shorter and require more charge cycles. Plotted over number of miles (or time if miles driven over time is constant), it might look exponential decay. Your mileage may vary. Americans just want things to work and not worry about them. Nissan has like a full page of bullet point you are to follow to prevent degradation. They sold their battery company, for a song, indicating an inferior product. The original battery was widely reported as having problems in hot areas, and people were selling their Leafs and getting like 30 cents on the dollar for them. Later versions of their battery were improved, but their adamant refusal to adopt a LTMS for the pack, showed a lack of flexibility and determination to argue there was no reason for concern. Now the latest version of the Leaf the 60 kWh is coming with LG Chem batteries and LTMS, so that says a bundle about Nissans battery problems. If this is typical of the current battery, I think Nissan made the right move by skipping the TMS. Other than Tesla, they’re the only ones aiming for 100,000/yr profitable production, and I don’t think it would happen with a higher price (unless they figure out how to match Tesla in battery price, but everyone wishes for that). I doubt the 60 kWh version will sell in high volume. Not only does LG have limited production, but add $6k and you’re getting near Model 3 pricing, which has a bunch of advantages including Tesla resale value. I could be wrong, but I think the $30-35k niche is the limit of the Leaf’s appeal. The sale of AESC is probably more about cost than reliability. They can’t match the production costs of Korean and Chinese batteries. When comparing 2-3 years into the future, the Tesla Model 3 resale value, to that of a 60kWh LG Chem 2019 Leaf, the Tesla depreciation schedule should be less, but what the % difference is, remains to be seen. The 2019 Leaf being a hatchback, does offer some additional utility, that the TM3 lacks. So there will be some trade offs, that will change the resale dynamics of these two different LTMS battery EVs in 2021-2022. Comparing a non-LTMS 2018 Leaf to any Tesla, is not really much of a comparison at all. Also, the Leaf gets discounted by the dealer and Nissan USA including 0% financing, and the leaf will still qualify for the full tax credit when Tesla is down to 25% or 0. I don’t, of course, have any idea what the deals will be on the Leaf 60 (my name) but one should consider real world selling prices when comparing vehicles. They likely sold the battery division chiefly because volumes were too low to remain cost-competitive with larger cell makers; and also to have more flexibility in the future… It doesn’t say much about their technology being inferior or not. Yeah, with the Leaf and battery pack degradation, your mileage may vary a lot. There’s a problem with lack of consistency. Graphs of data from aging Leafs make it pretty clear that the loss of capacity varies a lot. The data points are all over the map; see graph below. 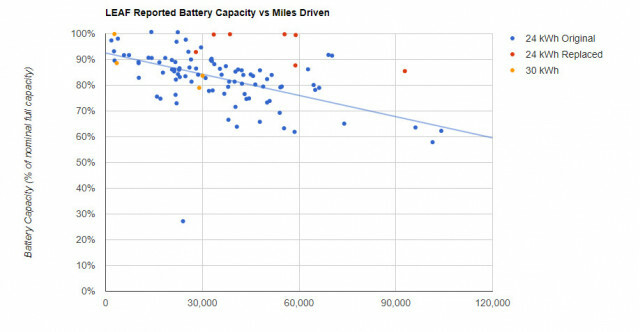 By comparison, a graph of battery pack aging in the Tesla Model S shows a pretty tight clustering of the data. Presumably that will be the rule of thumb for other BEVs with battery packs protected by an active TMS (Thermal Management System). With the Leaf, how fast your battery will fade is basically a crap shoot. I think the data suggest that it’s not just the lack of an active TMS; it’s inferior battery chemistry. If the battery chemistry was up to snuff, then most likely Nissan wouldn’t have sold off their battery making division, AESC. Yup, it’s not just SOH. To remain practical, the degree of charge tapering matters a lot. Nissan Leaf BMS will start tapering earlier as the vehicle ages. My 2015 starts at 35% now. Useless for any trips that need DCFC. SOH is still close to 94%. Mostly L2 charging. Any L3 is just once per trip at normal temp. My 2017 (less than 8K miles) starts at 75%, used to be past 90%. Lack of TMS is big deal. One L3 takes battery temp to near red. So if this article is trying to say the 40kWh battery should be good, I say there’s insufficient data. Without TMS the main problem is the climate (ambient temperature). Driving around in Arizona at > 100F (40C) = degrading faster — so your shot-gun points might be the result of different locations : bottom points in hot climate, top points in moderate climate. Good info, they have NMC now so that could help. The stacked modules under the front seats seem to get the most heat. Based on how the post-2015 gen1’s behave in this cold climate i’m in, i’m expecting the SOH to actually rise a bit during winter months. In 8 months: “Other interesting data includes the fact that it has had 165 DC fast-charge sessions and 163 level 1 or level 2 AC charges in its short history.” Yikes! How was this car unplugged long enough to rack up over 12,000 miles? The fact that this driver DCFC’d his Leaf 165 times in 8 months and only saw approx. 2.5% degradation is an excellent sign. Exactly my thoughts! This is a promising result! This is some heavy DCing and the battery is holding up nicely. Remember, the degradation is not linear. Teslas have close to 10% drop in first 2-3 yeras and pretty much flatten out after. 5% loss in first 50 000 miles then 1-2% per 50k. Off-topic question, but can the LEAF be used as a battery bank for homeowners with a PV array? Wasn’t the CHAdeMO standard designed to be a two-way street to support car to grid energy transfer? That might be enough to push me towards a used (heavily discounted) LEAF. IIRC Nissan claims that the 2018 model is capable of sending power back to the charger… Though I don’t think it’s a good idea to do so regularly, as the accelerated battery degradation likely makes it more expensive than getting a dedicated storage battery. Thank you, a few internet searches yielded a lot of results. I wouldn’t use the feature on a daily basis (i.e. time of use shifting), but as an emergency load bank that allowed a PV array to function during a power outage and to provide some basic lighting and amenities during nighttime power outages. Yes, that would be a good use case. I’ve had mine 4 four months and just crossed over 20,000km. No dc quick charging but I also don’t have Leaf spy for it. Great cars with great batteries. Hopefully all EV sales will increase as a result of this good news. We need millions of inexpensive EVs with every manufacturer marketing several models. LION batteries typically loose the first 10% pretty quickly then settle into a long long drawn out period of extended service.